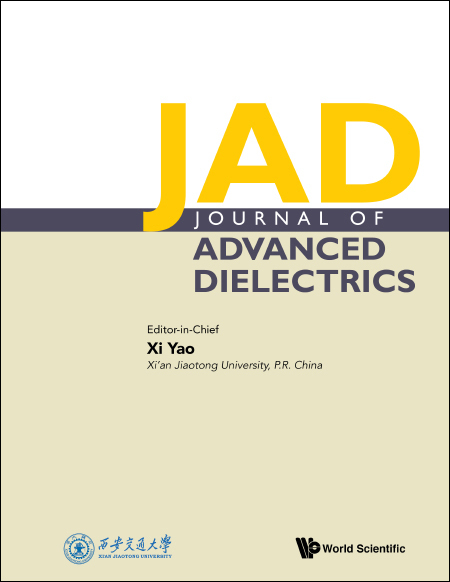 Abstract: Journal of Advanced Dielectrics, Volume 09, Issue 01, February 2019. The electronic structure and optical properties of Ca3(Mn[math]Ti[math]O7 ([math], 1/8, 2/8, 3/8, 4/8) were studied by first-principle calculations within the generalized gradient approximation approaches (GGA). The lattice constants of Ca3(Mn[math]Ti[math]O7 increase with the increase of Ti[math] content caused by the substitution of Ti[math] with larger ionic radius for Mn[math]. Ca3(Mn[math]Ti[math]O7 is a direct band gap semiconductor, and the band gap ([math]) increases with the increase of Ti[math] content. From the density of states, the introduction of Ti-3[math] states can weaken the effects of Mn-3[math] states on the bottom of conduction band and has little influence on O-2[math] states on the top of valence band. The introduction of nonmagnetic Ti[math] ions can weaken the magnetism of Ca3(Mn[math]Ti[math]O7. According to the Mulliken population analysis, it is found that the introduction of Ti[math] enhances the electronic accepting capacity of oxygen ions and enhances the electronic losing capacity of manganese ions. The bond strength of Ti–O covalent bond is stronger than that of Mn–O covalent bond. Furthermore, the optical properties of Ca3(Mn[math]Ti[math]O7 was calculated. As Ti[math] content increases, the absorption edge of Ca3(Mn[math]Ti[math]O7 has a blue shift, the static refractive index [math] decreases, the static dielectric constant [math](0) decreases, the position of loss peak moves to higher energy. A series of Pb(In[math]Nb[math]O3–Pb(Zn[math]Nb[math]O3–PbTiO3 (PIN–PZN–PT) ternary piezoelectric ceramics with compositions at the morphotropic phase boundary (MPB) were prepared. The phase structure, microstructure, electrical properties and temperature stability of PIN–PZN–PT ceramics were investigated systematically. The structural analysis indicated that an MPB phase consisting of rhombohedral and tetragonal phases was formed in all ceramics. For the selected compositions, dielectric measurements demonstrated that the Curie temperature [math] changed from 237∘C to 295∘C and showed a strong trend of compositional dependence. All the samples showed good piezoelectic properties. Particularly, the 0.35PIN–0.40PZN–0.25PT sample has the optimum piezoelectric properties, the piezoelectric coefficient [math] is 589 pC/N, the electromechanical coupling factors [math] and [math] are 59% and 49%, respectively. Compared with PZN–PT and PMN–PT ferroelectric crystals, the superior limit of usage temperature of PIN–PZN–PT ceramics was achieved around 230∘C by thermal depoling method. These results make PIN–PZN–PT ceramics a promising material to meet the practical demands of higher temperature and larger electric field operating ranges. The polycrystalline ceramic Pb[math]Ba[math]BiVO6 manifesting the complex double perovskite structure was tailored by the conventional solid state route at a moderate temperature. Qualitative phase analysis and formation of the ceramic were affirmed by XRD analysis. The X-ray powder diffraction pattern of the compound explored at room temperature affirms the single phase formation with double perovskite structure exhibiting rhombohedral phase. Microstructural analysis of the studied compound procured from the Scanning Electron Microscope (SEM) validates the formation of dense microstructures and nonuniformly distributed grains with minimal voids. Compositional analysis was shaped through the Electron Diffraction Spectroscopy (EDS) confirming the absence of contamination of any other metals apart from the mentioned ones. Dielectric (Cr and [math]) parameters of the compound were studied using the LCR analyzer at different temperatures and wide range of frequencies. The polarization and dielectric study affirms the presence of ferroelectricity in the material with transition temperature much above the room temperature. The tangent dielectric loss of this sample being almost minimal at room temperature attributes it to find applications in different grounds of electronics. Optical equities of the ceramic were further analyzed by the RAMAN, FTIR, UV–Vis and Photoluminescence spectroscopy. Abstract: Journal of Advanced Dielectrics, Ahead of Print. Charge nonstoichiometric 0.94Bi[math]Na[math]TiO3–0.06BaTiO3 (BNT-BT) ([math]) ceramics were prepared and investigated. The depolarization temperature was dependent on composition and the ferroelectric property of [math] was suppressed more significantly than the [math], indicating the composition-sensitive electrical properties. Furthermore, the [math] was close to the insulator/conductor composition boundary while the [math] was close to the ferroelectrics/relaxor boundary. These results were attributed to the complex effect of donor doping and acceptor doping on depolarization field. This work provides robust clues to tune and/or design electrical property and conductivity of Bi[math]Na[math]TiO3-based materials. The dielectric ceramic of barium dititanate compound BaTi2O5 had been prepared through the hydrothermal process by applying different parameters, such as pH-value, reaction time, temperature and pressure. The prepared powders were examined by X-ray diffraction (XRD). The predominant phase was a monoclinic phase with lattice constants ([math], [math], [math] Å), ([math], [math]), and the unit cell volume (527 Å3). The surface morphology was demonstrated by Scanning Electron Microscopy (SEM). It exhibited the grains in spherical and elliptical shapes with high homogeneity. The shapes of nanostructure were analyzed by Transmission Electron Microscopy (TEM). The appearance of nanostructures like the nanoparticles and nano rods were found. The size of nanoparticles was in the range of 9–31[math]nm, and size of nanorods was 32–37[math]nm. The dielectric measurements were done by using LCR meter at different temperature and frequencies (10, 50 and 100[math]kHz). It was clear that the Curie temperature had a high value up to (485∘C). The relative permittivity was partially changed for two prepared samples regarding high pressure and long reaction time, which were the main preparation conditions of hydrothermal method. The frequency-dependent percolation and scaling behavior of a variety of polymer/metal composites (PMC), based on polyvinylidene fluoride (PVDF) matrix and various types of fillers such as; metal/alloy particles of different sizes, prepared through cold/hot pressing process conditions have undergone investigation. The universal percolation behavior in the vicinity of percolation threshold ([math]), i.e., [math] and [math] is well satisfied, which suggests [math] to be independent of frequency, where [math] and [math] are the effective ac conductivity and effective dielectric constants of the composite and [math] is the frequency of applied ac signal. The obtained experimental values of the exponents are consistent with the inter-cluster polarization model ([math] and [math]), satisfying [math]. The widely used percolative equations are well fitted with the experimental results of all PMC at all values of the frequency. The value of [math] is found to be independent of frequency of the applied signal, suggesting the studied PMC are real percolating systems. The critical exponents ([math] and [math]) which characterize the divergence of [math] and [math] in the vicinity of [math] are found to decrease with the increase of frequency. The rate of decrease of ‘[math]’ and ‘[math]’ with increase of frequency is attributed to the method of preparation, size of the fillers, adhesiveness of polymer/filler and the rate of decrease of [math] with frequency (due to the absence of different extents of contributions of various types of conventional polarizations). Photocatalytic degradation processes of different materials are fitted with Mittag-Leffler function and incomplete gamma function, which are response functions for Cole–Cole relaxation and Davidson–Cole relaxation. The fitting results show that both functions can fit experimental data fairly well. The order of derivative in the kinetic differential equations can be either less, or greater than one. In the case of the order of derivative is greater than one, only incomplete gamma function is reasonable for describing the photocatalytic degradation. This work further confirms the existence of the universality in photocatalytic degradation kinetics. Nitrides MAX have attracted ever-growing interest owing to its unique metallic and ceramic characteristics and properties. Here, we report on the synthesis of highly purified Ti2AlN and Ti4AlN3 powders from Ti, Al and TiN powders by a facile atmosphere sintering method. The obtained nitrides show highly pure phase and excellent layered structure. Except for the composition difference of raw materials, both the nitrides can be sintered and obtained by same sintering temperature and holding time, which thus makes less processing time and less usage of synthesis parameters as compared to previously synthesis methods. To our knowledge, present work is one of the few reports on synthesis of Ti4AlN3 and Ti2AlN using atmosphere sintering method. Furthermore, the lattice changes of the layered structure of Ti2Al[math] ([math]) were studied by changing the composition of [math] position from the synthesis of Ti2AlCN and Ti2AlC, and the optimal formulation and synthesis mechanism of Ti4AlN3 were also studied. As one of the representatives of lead-free NBT ceramics, Na[math]Bi[math]Ti4O[math] has still attracted much attention due to its excellent dielectric properties and has become the focus of research. However, its piezoelectric properties are far from satisfactory. In order to improve the piezoelectric properties of Na[math]Bi[math]Ti4O[math], Na[math]Bi[math]Ti[math]MgxOy–BaTiO3 (NBTM–BT) composite ceramics were synthesized by a conventional mixed oxide route and sintered at 1040∘C through two-step method. We optimized the electrical properties of NBTM–BT by changing the stoichiometric ratio of Mg content and studied its microscopic mechanism. The piezoelectric coefficient ([math]) is stable at about 20 pC/N. Moreover, the maximum remanent polarization (2[math]) of the ceramic is 3.08[math][math]C/cm2 with the coercive field of 18.01[math]kV/cm. The dielectric constant and dielectric loss for Na[math]Bi[math]Ti[math]Mg[math]–BT composite ceramic were found to be 486 and 0.17 at 10[math]kHz, respectively. The characteristic peaks of BT and Na[math]Bi[math]Ti4O[math] can be observed clearly from the X-ray diffraction analysis. SEM analysis showed that all samples were well crystallized. Consequently, the piezoelectric and ferroelectric properties of Na[math]Bi[math]Ti4O[math]–BT composite ceramic will be enhanced much by Mg doping, which means it has a wider range of applications in electronic devices such as piezoelectric devices. In the present work, the comparative study of the electric response of Sn2P2S6 films to the visible light action was carried out without and under external electric field. The light flux modulated by a chopper induces the integral response comprising time-dependent photoelectric and photovoltaic components. It was shown that spontaneous polarization influences the electric response characteristics. In this paper, it is shown that for stable, steady state operation of devices typical of microwave and millimeter were electronics, no negative differential capacitance is possible with conventional thinking. However, it may be possible, with strain engineering of materials, to obtain some if not all elements of the differential capacitance tensor which are negative. Rigorous derivations are provided based upon analyzing the physics using thermodynamic phenomenological free energy. It should be emphasized that, even with strain engineering, and possible discovery of some negative capacitive elements, stable operation will not be obtained because the thermodynamics precludes it. In this paper, we report the effect of sulfur doping on the electrical and dielectric properties of semiconducting Sb2Se2S over wide ranges of temperatures (298–473[math]K) and frequencies (42–106[math]Hz). Sb2Se2S system has been prepared by the direct fusion and cooling cycle of a mixture of the constituent elements, in stoichiometric ratio and purity 99.999%, in vacuum-sealed silica tubes. X-ray analysis showed a decrease in the cell parameters [math], [math] and [math] upon doping with sulfur. However, the pure and doped Sb2Se3 showed the single orthorhombic phase structure. The permittivity of Sb2Se2S showed a decrease with increasing frequency due to a decrease in the average bond strength. While, ac conductivity increased with the frequency increase, obeying the Jonscher’s universal dynamic law. The conductivity temperature dependence is well described by the correlated barrier hopping model. The activation energy calculated from DC conductivity is found at higher value (0.79[math]eV) as compared to that reported in the literature for other antimony selenide compounds. Accordingly, a new Sb2Se2S compound is suggested which may be useful for electronic devices.